Picking up where we left off after the Kinabatangen River, on the island of Borneo, we decided it was time to start heading for the mainland of Malaysia. To do so we had a few transit options, all involving numerous legs and a visit to the airport. 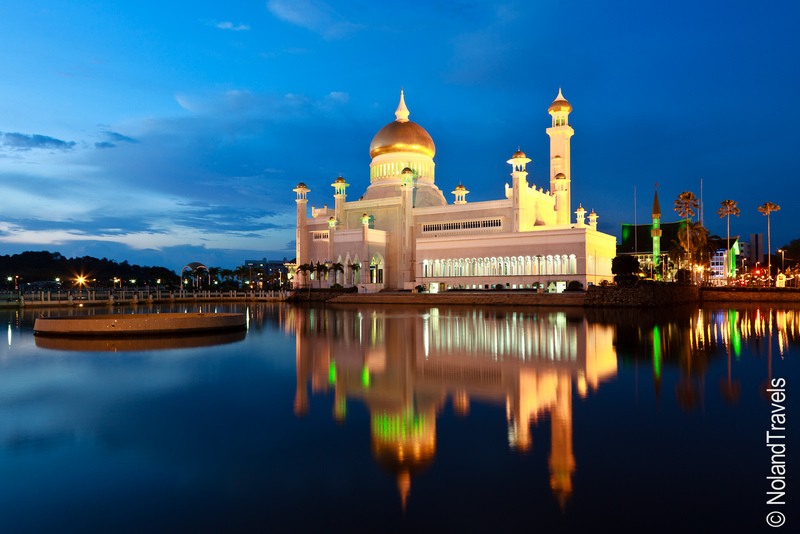 Along the way, we had met other travelers who recommended a visit to Brunei if you had time to spare. It was expensive but worth it they all said. 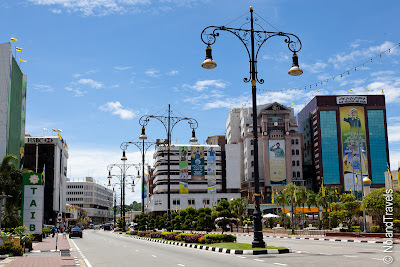 So, with time on our side, we took a small budget risk and opted for a longer journey to the mainland, visiting another country that calls Borneo home, Brunei. Officially named, "Nation of Brunei, The Adobe of Peace", it has a population of roughly 400 thousand. It was under the British Empire until the mid 1980's before gaining its independence. It has seen substantial economic growth in the last 30 years and is classified as a developed country. Fueling this growth are its vast reserves of oil and natural gas, making it the 5th richest country in the world. Brunei is governed by a constitutional monarchy and has a constitution based on traditional English Common Law. However, Islamic Shariah Law still takes precedence in some cases making it a very conservative country. 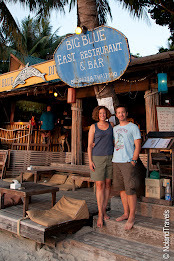 We were excited to visit a place we knew very little about or had any real expectations about. Leaving Kinabatangen, we endured the 6 hour bus ride on the rough roads of Borneo, arriving late in the evening in Kota Kinabalu. Bright and early the next morning we caught the first of two ferries that would eventually take us to Bandar Seri Begawan, the capital of Brunei. It was quicker by ferry than by land even with a stopover on the tax haven and duty free island of Labuan. Luckily, it was smooth sailing and we soon enough found ourselves in Bandar in need of accommodation. We found we were travelling in a shoulder season and had been having good luck negotiating rates by just turning up. Tourism is a relatively recent addition to Brunei which means accommodation is in short supply. There are a few 5 star places to stay including a huge palace built by the King, but backpacker accommodation is nearly non existent. 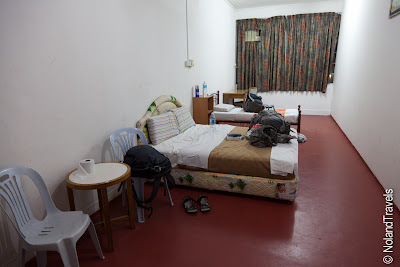 I won't go into too much detail but our only option was one of the worst places we've stayed. It was basic as you can see, although it did have air conditioning. It even came with a cut out in the curtain for the window unit. However, the toilet was the kicker. Shared bathrooms consisting of nothing but squat toilets; the shower head being inches away from where everyone was squatting. Always soaking wet and just not nice. They even charged for towels. All this "luxury" at mid-range Western hotel prices! We passed the sniff test and concluded showers can wait. Luckily, we came for the rainforest and not the city and we could cope for one night. After, checking in and dropping our bags we went out to explore. The city was very clean, modern and orderly. It wasn't nearly as hectic as other parts of Southeast Asia. The roads were lined with trees and flowers all of which were very well maintained. 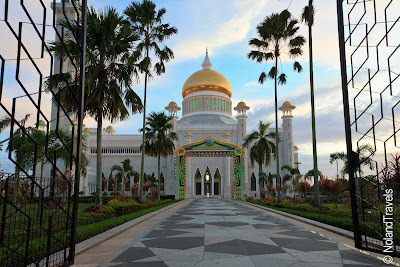 Walking around we felt very safe as we made our way to the Sultan Omar Ali Saifuddin Mosque to take some sunset photos. While we were there the evening call to prayer sounded which added an interesting dynamic to an already surreal view. 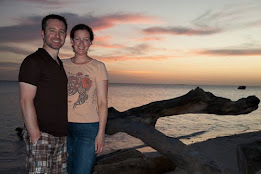 We lucked out with a good sunset and Steph was able to snap a great shot. There are other good things to see including a busy market and a water village, but we had an early start the next day. Instead we opted for a quick and easy dinner, *cough* at KFC *cough* (I know, I know, sometimes you just need some Western food), then we called it a day dreaming of tomorrow's rainforest adventures. We've talked about Russia. 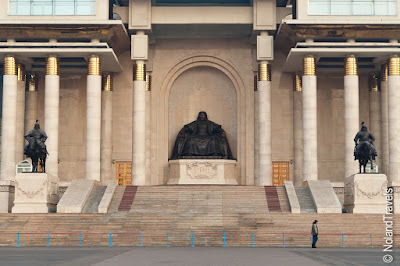 We've talked about Mongolia. And we've covered our trip in Beijing. What's missing? 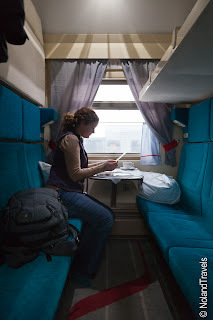 The train journey that took us there - the Trans Siberian Railway. Traveling in January during the dead of winter, we would cover some 5,000 miles across multiple timezones, through vast empty landscapes and sprawling cities. So, without further ado, here is our take on the epic Trans Siberian Railway journey. It's not in our normal blog style but we wanted this to be informative while passing on the stories along they way. Its long and I mean long, but its full of good information and stories. I've added a table of contents to help a with navigation. Enjoy! Winter or Summer For the Journey? Is There Anything We Missed? 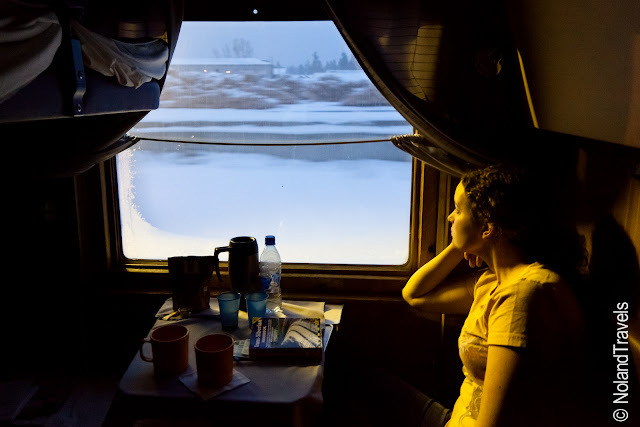 One of the misconceptions about the Trans Siberian is that it is one train. There actually is no single train called the Trans Siberian. 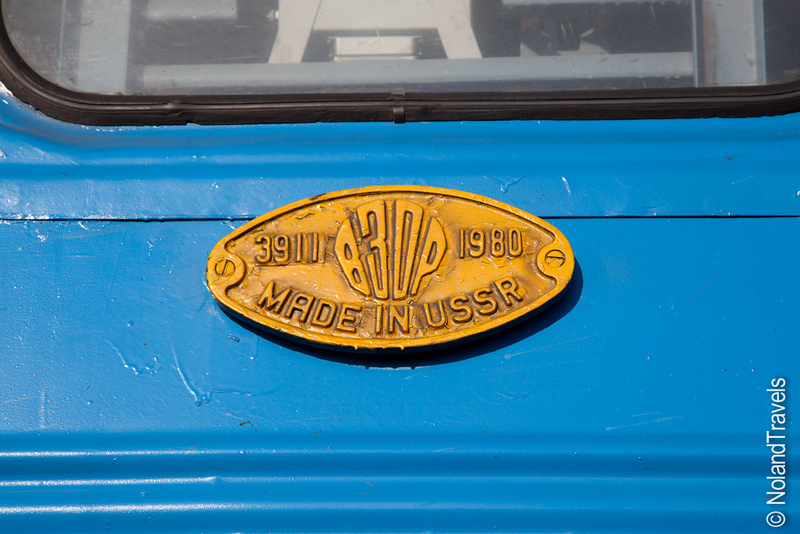 It refers to the network of railways than run across Russia and Siberia ending at various destinations extending beyond the borders of Russia. 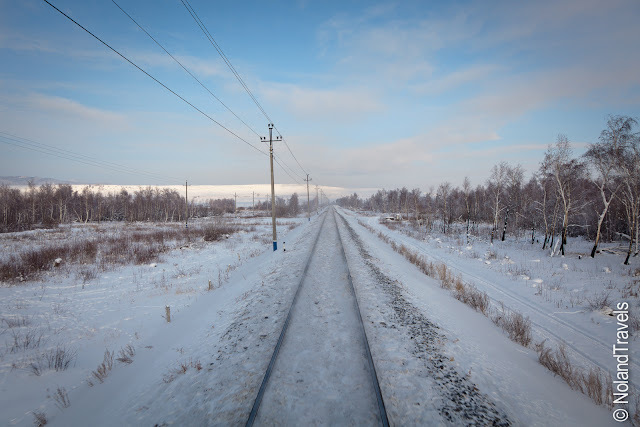 In saying that however, you can take one train from Moscow to Vladivostok which is a seriously long way, but most of the time travelers take a series of trains instead, opting to do a little sight seeing while breaking up the journey. The three common routes are called the Trans-Siberian (to Vladivostok), the Trans-Manchurian (to Beijing via China) and lastly, our route, the Trans-Mongolian (to Beijing via Mongolia). We took the easy way out and had an agent book all of our train tickets in advance after we customized the trip. It was more of logistics help than a guided tour. 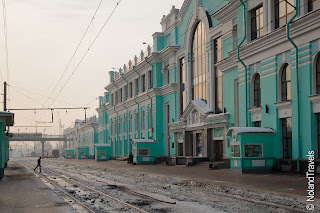 The agency booked all of our train tickets, hotels, a few transfers to/from the stations, walking tours or guides in each city and even one bonus outdoor activity in Yekaterinburg. Why did we go with an agent? At the end of 2011 we were both busy at work, trying to organize our international move from London to the US which included organizing our cats’ importation, trying to say goodbye to nearly 5 years of friends and colleagues by having Christmas and/or leaving drinks/dinners almost every night, Christmas shopping and trying to pack and plan for 5 months of travels. This meant we just didn't have the bandwidth to do the research or planning needed to buy the tickets ourselves. We paid a premium for it, for sure, but that was the only way it was going to happen for us. 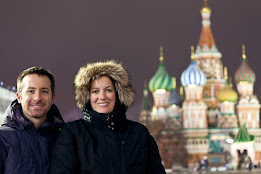 The Russian visa process wasn't nearly as difficult for us as we thought. We had heard horror stories of pages and pages of forms and providing endless documentation of your finances and/or employment. Other than a normal amount of visa paper work we did have to book the train and hotels before we had a visa. It seems backwards and is a little unsettling for the what-if scenario, but its common practice when traveling to Russia. Once you book your hotels and/or tours then the hotel or tour company provides you with the essential "invitation" that you need for the visa application. We thought this was all simple enough. Almost as important as the tickets, we also promptly bought Bryn Thomas’ Trans-Siberian handbook – an absolute essential guide book for your journey. In addition to giving you a guide for all the cities you could possibly stop in, it also gives you a kilometer-by-kilometer guide of what you are seeing outside the window. The only catch is seeing the markers. They are next to the track and the best way to see them is to smash your face up against the window and wait for one to fly past hoping to make out the number. It took a little practice but we got the hang of it. It was fascinating to be passing a small unassuming town and to know interesting historical, political or other random facts. One of the best was being made aware that you can see the Great Wall from the train. Thanks to the timetable posted in each train car which showed the timing and duration of each stop for that particular train, we knew what time we'd be approaching the Great Wall. Sure enough, it was there. A thin, small line at the base of the mountains. The barren mountains were the color of golden sand and the wall was made of rocks in the same shade making it quite difficult to spot. The view from the train was a little anti-climactic but without the book we wouldn't have known to even look for it. Even though seeing it at such a distance, it really built the anticipation of seeing it in person! We ended up reading the handbook cover to cover and loved every page – sadly, we left our copy on a bookshelf in a Beijing hostel to save on weight…I was actually looking forward to having it proudly on a bookshelf in our home. 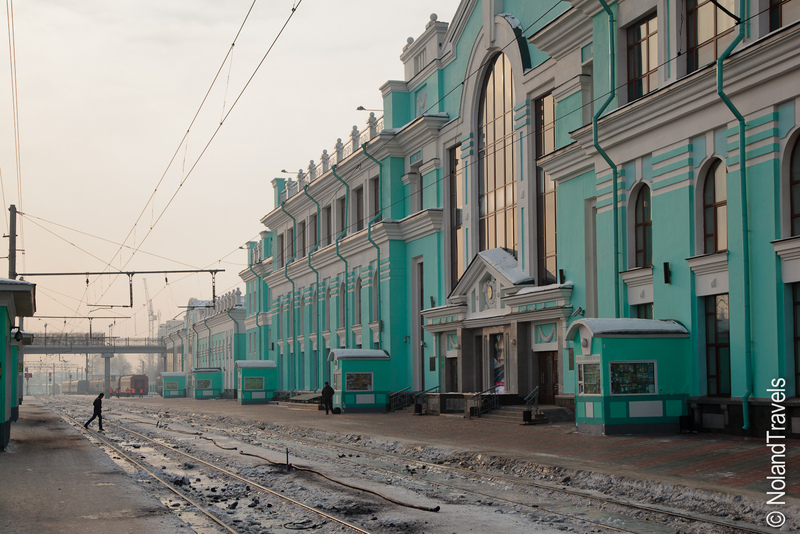 We began our journey in St Petersburg, Russia, standing on the platform ready to embark on one of the greatest train journeys on the planet. We were full of excitement and itching to get started. This was the first of our four legs taking us to Beijing, but it was the shortest leg. We are planners and don't like being unprepared so this was the perfect way to start for us - a quick journey almost like a trial run to get a better picture of what was ahead. After that leg we could re-evaluate, picking up any needed supplies or making any changes for a more comfortable ride. At the station we watched intently as others boarded the train, looking for routines and tips. Do what the locals do right? For these train journeys it is helpful to get there as early as possible for two reasons. First, to give yourself plenty of time to find your carriage. Running to a carriage at the other end of the platform with all your luggage isn't fun. Second, to try and be the first people in the cabin so you can get settled before the crowd arrives. Get in, pull out what you need and store your bags, so you can relax as you meet your fellow cabin mates. Boarding our first train was fairly straightforward, even with the cabin attendant only speaking some English. We showed our tickets and passports then were allowed to board. 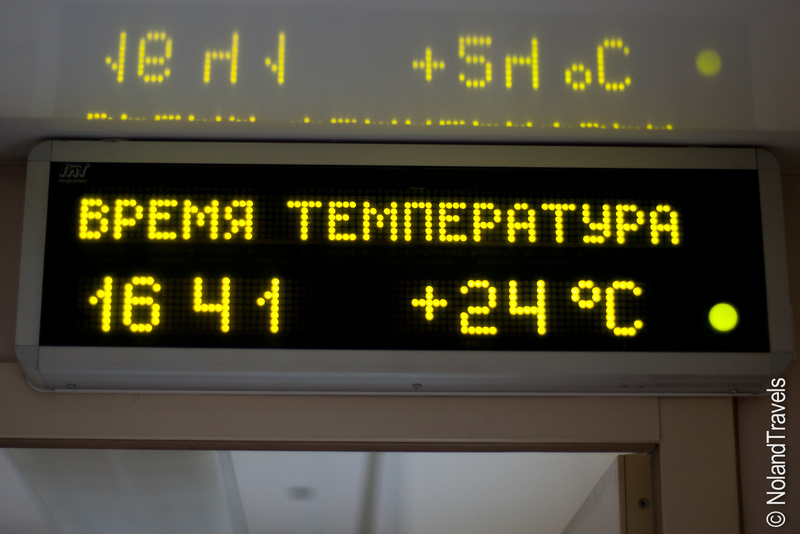 The first thing we noticed was the temperature on the train, it was HOT! We quickly tucked our bags away awaiting our cabin mates who arrived early too. They were a young Russian couple and in watching them settle in the cabin, we took notes. They had a more comfortable set of clothes/pajamas easily accessible which they pulled out to change in to. They immediately stored their main bags and had a separate smaller bag that had "train provisions" such as their food, forks, napkins, drinks, etc. which they just slid under the bottom seat (our version included a few extra items below). After they settled in we found that he could speak a little English which made for some light conversation. thinner/cooler/more comfy clothes - it was hot on the train and we often needed to peel off the thermals and layers we had been city touring in. train shoes - any kind of flips flops, house shoes or slide on shoes. You don't want to be doing up laces every time you want to walk around or go to the bathroom. Josh didn't have any slide on shoes for the first train but lucked out that our lovely Yekaterinburg hotel had those free cheap house shoes for use in your hotel room. 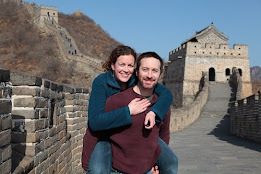 They wore out by the time we got to Beijing but perfectly fit the bill! silk sleep sacks - we didn't need much covering at night; these are lightweight and we enjoyed the freshness of our own sleep sacks. These babies are one of our favorite pieces of travel gear, by the way! Expensive, yes, but they are very comforting in "rough" sleep environments. toilet paper - the bathrooms often run out of this necessity. Plus what's stocked on board is worse than tissue paper. anti-bac hand wipes - self explanatory, I think. baby wipes - for everything other than your hands...again, hopefully self explanatory given you're on a train for many hours/days without showering facilities. reading material - we had paper guide books and Kindles - perfect! Thermos and/or thermal cups - we had a 20 oz. travel mug that we used to transport hot water from the samovar to our cabin to make coffee in our mugs or cook our pot noodle dinners. our food bag which we slide under the lower bench seat, complete with a pack of small plates, forks, knives, spoons, normal plastic cups, vodka shot sized plastic cups and napkins. The larger grocery stores in cities along the way aren't unwise - they have handy little packs of all of these mentioned goodies. We couldn't believe they even had the vodka shot cups! Strange as it may seem, our guide pulled out one of these packs the day we went ice-fishing for our lunch so I guess they're not just used on the trains. and plenty of cash, stashed safely in your waist belt of course, because we didn't see any ATMs easily accessible along the way. This is a big topic since you don't have many options for food. We ended up opting to eat mainly pot noodles for reasons below. The book and lots of online blogs just rave about the dinning car. Our experience however, didn't live up to the hype. 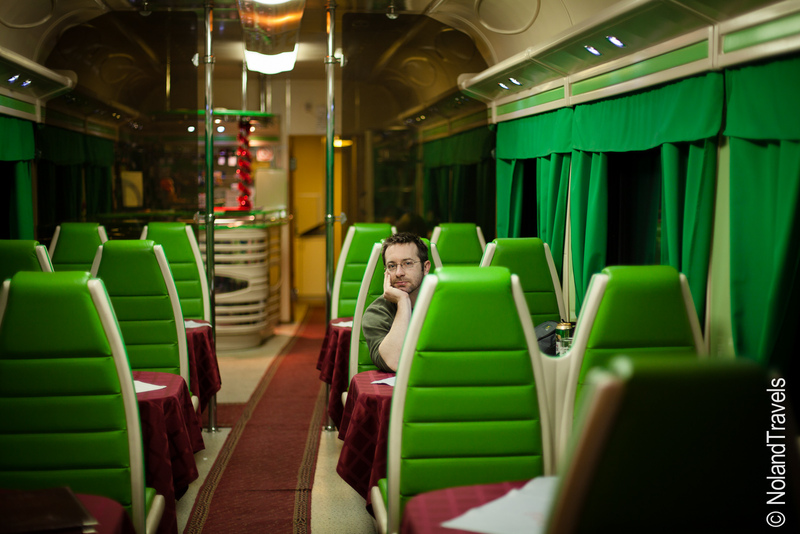 It was about 7:30pm as we entered the dining car on that first train from St. Petersburg to Moscow. We expected it to be full, wondering if we'd get a seat or if we'd have to share and who we'd meet. Opening the door most of the lights were off. Walking to the bar we found some menus when a lady came out of the kitchen and flipped on the lights revealing a bright green spaceship looking dinning room. But, we were the only customers. Sitting down we brushed up on our Cyrillic and settled on a "hidden chicken dish, a pork dish with mushrooms and a side of potatoes to share. They came out in about 10-15 minutes served on small salad plates. It was a good thing we didn't have a massive appetite but they tasted good and we were satisfied. As for prices, its not good value. All in all, we paid about $25 without any drinks. Not the best value but we didn't have any problems with the quality or taste. Initially we'd budgeted dinner in the dining car every night. It was supposed to be part of the experience and we would be happy to share some Vodka with a few Russians or whoever we could. On another train, we tried again. The first was a shorter train journey and maybe people just didn't eat in the dining car on that train. This time on the Mongolian bound train, the lights were on but the attendant and chef were watching a movie on the TV, again without any other customers at dinner time! Although, one other passenger came in for a quick meal while we were ordering. This menu had one page in English which made ordering a little easier, opting for a chicken dish and a beef dish. They had different dish names and different descriptions but when they were served, each had the same topping of tomatoes, cheese, pickle and maybe a little mayo or sour cream looked exactly the same. Since we were 2 of the only 3 diners, we figured the chef couldn't be bothered to make two distinctive meals. The food was tasty and hit the spot. The portions were bigger but it was more expensive. A little over $30 without drinks. When it came time to pay the bill it was higher than we expected. We saw a page in the menu in Russian that said something then "10%" so we figured part of it was a 10% service charge. But there was still another excess 100 rubbles we couldn't figure out. Trying to tell the waitress our problem, I wrote down the price we thought we should be paying. She shook her head and pointed to the laptop we had plugged in the electrical socket next to our seat. Then she pointed to the extra 100 rubble charge on the bill. Are you kidding?! You're charging us to use the electrical socket?! It was only about $3 but she wasn't having any part of us disputing it. The frustrating thing was that there were outlets in the hallways of the cabin cars that they don't charge for. Tip for other travelers - use sockets wisely! That was our last trip to the dining car. Pot noodles won out. For most of our journeys we stocked up on groceries because that's just how we are. Each train carriage also has a samovar - a boiler where you can get an endless supply of hot water for drinks or food. We were able to get big hearty pot noodles in stores for about $1 each. They come in plastic or Styrofoam containers with spice packets and freeze dried veg and/or meatball packets. All you had to do was add hot water. 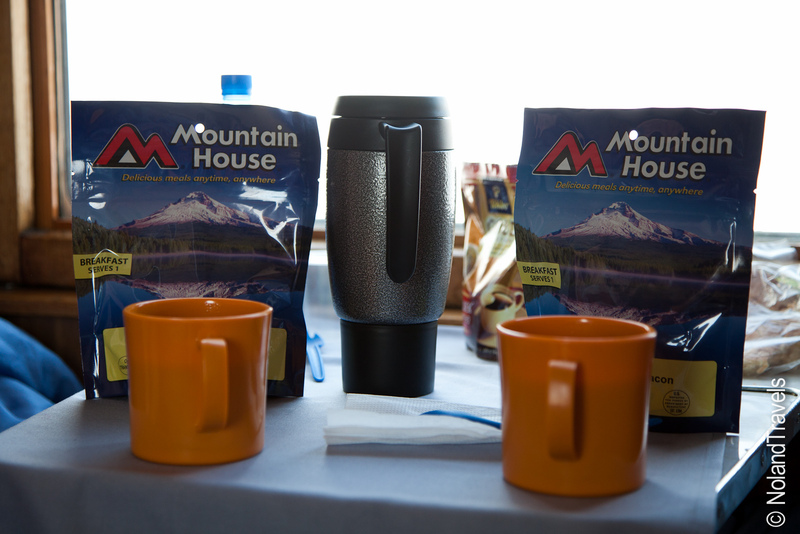 We also brought along instant coffee of the 3-in-1 variety so we didn't have to mess around with sugar and creamer packets as well. For breakfast, we simply bought some fresh cinnamon rolls or sweet rolls from the grocery store bakeries. And, it goes without saying, we were prepared with the customary bottle of vodka. Note you can also buy pot noodles and other snacks and drinks at station stops very easily. There isn't a huge need to carry enough for you entire journey. 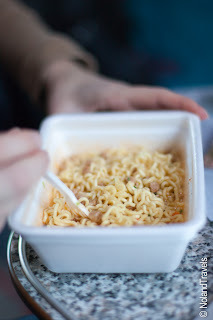 It'll cost a little extra but the bulk of the noodle containers can be a bit cumbersome. Save the space for harder to come by things such as bottles of vodka. One other side note, we planned really far ahead and brought along some freeze dried food for breakfast. Before we left Kentucky, my dad gave us a few "eggs and bacon" meals for the journey. The train was only a few days into our trip so we didn't have to carry them for very long. They made a good change from pot noodles a few mornings. 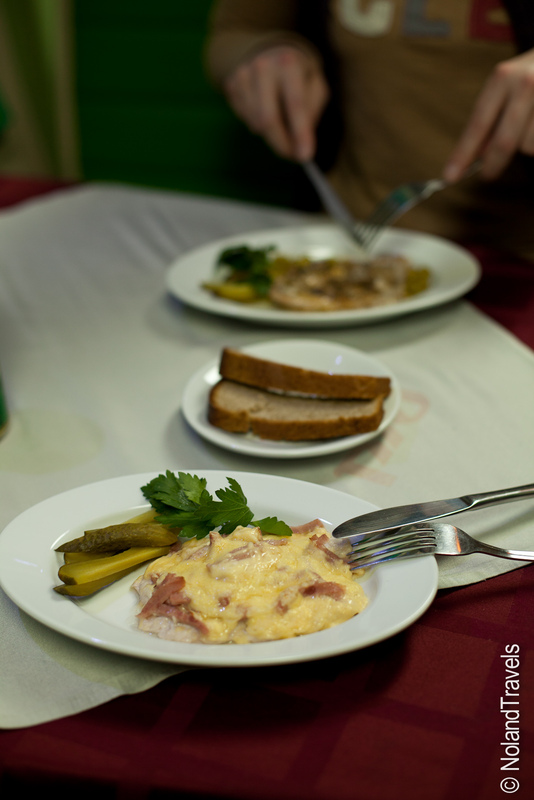 I'm not sure how common this is but our overnight train from St Petes to Moscow included dinner. Err, sort of. As the train was departing a lady came around carrying a duffel bag full of small food containers. Our cabin mate had a hard time translating the options to us so we just followed his lead and said we'll have what he's having. Daring? Yes. It was a small container of thinly sliced raw white onions with a touch of carrots and maybe some vinegar or something. That was it…not quite a full dinner. I only managed a couple small bites (neither of us like straight-up onions). Josh, being the polite and adventurous traveller, downed his dish. This was a mistake. He woke up in the middle of the night being sick. That wasn't a good experience with the state of the toilets on that train. Avoid the included meals, especially if they are of the raw fruit and veg variety as that is a notorious travel no-no. As we pulled into the station in Moscow after Josh had his sick night, he had to escape the sauna before being sick again. He was feeling weak and terrible and needed to cool down. This left me to pack and get all of our bags to the platform. 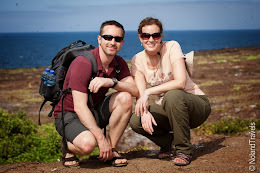 A rule of thumb to consider when traveling with a partner or friend, is to not pack more combined bags / weight than one of you alone can carry. If one of you goes down injured or sick, the other person needs to be able to manage the bags at least for a little while. We passed the rule, but only just. There are different classes of tickets you can book but almost every traveler books the standard 4-berth cabins. 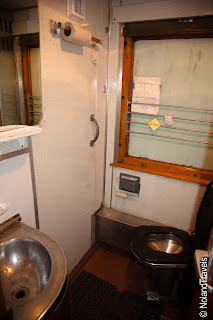 Other than some trains being slightly older/newer - the setup and amenities were almost identical on every train: 2 western toilets in each carriage, no showers (that we knew of...), a constant supply of hot water in the samovar and a cozy 4-berth cabin. The cabins had two bench seats (beds) with a small half table at the window. Above each of those was another bed that flipped up during the day to make the cabin feel a little less claustrophobic. There was also a deep storage cavity above the hallway - often used to store bedding supplies during the day or larger luggage. We had the same class of cabins throughout but did luck out that the Yekaterinburg bound train was regarded as a premium train. It didn't have any other amenities but it was lighter, brighter, newer and had a wonderfully clean toilet with toilet paper and paper towels. Our premium train car was empty being just us and one other passenger in the entire car. I'm sure the cabin attendant was expecting an easy day's work given he only had 3 passengers. However, we couldn't read the Cyrillic signs in the bathroom and apparently toilet paper in the loo is a no-no for the fancy premium toilets. Each of us mistakenly put paper in the toilet which of course created a clog. To fix it, the attendant had to reset the electricity on our train carriage. The lights flashed and it reset. We had an unhappy attendant come to our cabin to try to explain what we had clearly missed on the signs. Oops, our apologies! With it being the middle of winter and after the holiday season most of our other trains were similarly spartan. For the majority of our trip it was just the two of us in our cabin. Depending on your comfort level of sharing cabins with total strangers for days on end, this was a perk of traveling in the winter. They supply a pillow, sheets, blankets and sometimes an additional layer of padding for the bed. We used our silk sleep sacks and only rarely had to pull on an additional layer for warmth. It's a fairly decent nights sleep for people of average height especially when you don't have noisy or snoring cabin mates. The curtains are fairly thick and do a decent job at blocking out light (although we were there during the short winter days). Actually going to bed was a bit magical for us. You make your bed, you're toasty warm and soon enough with the rocking of the train and the repetitive clickity clack of the wheels, you find yourself in dream land in no time. 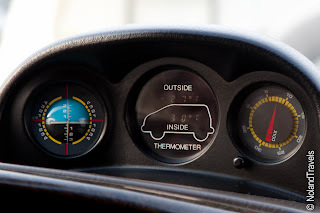 Since we travelled in the winter, the heaters were on and the windows locked shut. All of the trains we took were on the hot side. 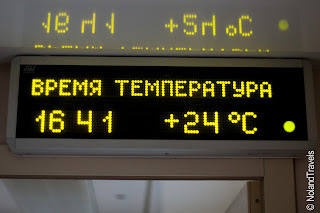 Throughout Russia the trains run off electricity so there is plenty of energy to heat the train and they did - to a minimum 75 degrees (24 C). Traveling during the winter you need to prepare for boarding the trains with a lightweight change of clothes. 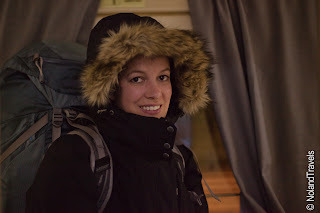 We arrived to the trains in full winter thermals because we had been city touring. So, changing clothes almost immediately upon boarding was always required and many Russians will be doing the same. We changed to shorts and t-shirts most of the time. The Russians opted for some form of pajamas or lightweight athletic wear. You could almost break a sweat just staring out the window. The trains along the way may use coal for power instead of electricity. Those tended to be cooler but still only jeans and a long sleeve shirt at most. Possibly a blanket at night. Another related tip is that you can kick out your cabin mates to change clothes. One of our cabin mates did just that by saying, "Can you exit the cabin for the lady?" Seeing we were confused he clarified with "Change dress". Ah, ok, sure. She wants to use the cabin to change clothes. For those of you who don't want to use the onboard toilets to change clothes then keep this in mind. For us passing the time was peaceful. It was tropical weather onboard and we were in shorts and a t-shirt, staring out the window at the vast and snowy countryside of Siberia. We literally did nothing most days - staring out the windows, snapping a few pics and catching up on reading in our guide books - mainly the histories. It was wonderful! It's a good dose of rest and relaxation at a leisurely pace. Eat when you want, sleep when you want. I think I'll have another coffee. And best of all, no Internet or phone. For once in our lives, we didn't even have mobile phones. 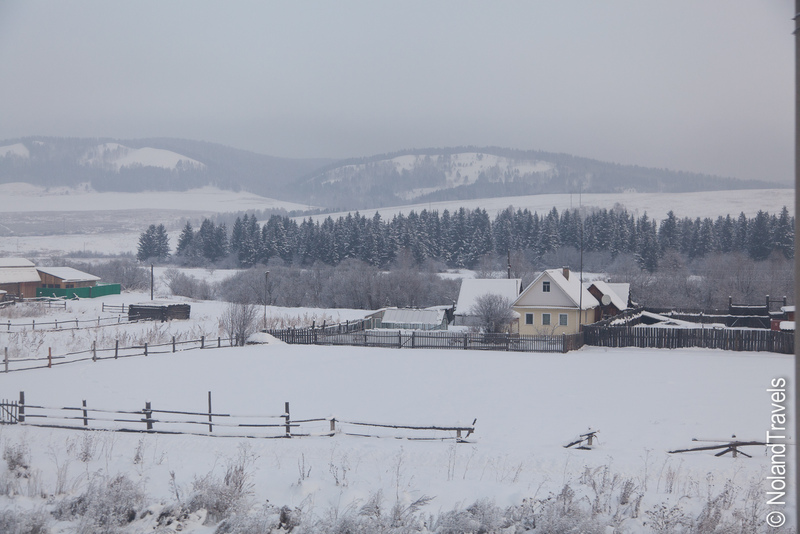 Enjoying the beautiful snowy scenes from a warm and cozy train was fabulous. The time passed amazingly fast! All of the trains make scheduled stops along the way. These stops are posted in the cabin and can last anywhere from a few minutes to a few hours (only at border crossings). The average stop was probably between 10-20 minutes. We would get off the train for a few minutes to stretch our legs, buy some additional food/drink or just to see some old train engines on display. At the stops its easy to pick up a variety of provisions. Sellers stand on the platform selling the basics or you can venture to the main station shops to pick up more essentials such as beer or toilet paper. Some platform sellers also offer things of a wider variety such as drinking glass sets, if you fancy that sort of thing! I understand this will be individually different on each train but part of the purpose of taking the Trans Sib is to meet interesting people along the way. 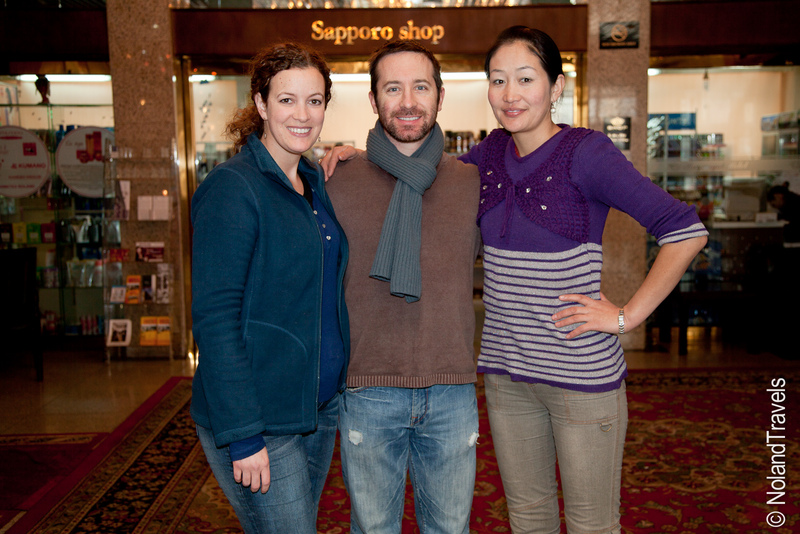 Here are some stories about our new friend, Andre, who we met on the way to Mongolia. Boarding our longest leg to Mongolia from Yekaterinburg we were the only people in the cabin. The train departed at an awkward 1:40am and it wasn't long till we hit the sack. Our guide said don't be alarmed if somebody joins you later on. And sure enough, in the middle of the night, maybe 5 in the morning, someone was pulling on our locked cabin door. After letting them try a couple times, hoping they were actually at the wrong door and they'd go away, I finally came around enough to unlock the door and a single guy entered. The next morning, we greeted our new cabin mate - a 30 year old guy named Andre, from Russia. He spoke pretty good English and we were able to have all sorts of conversations with him throughout the day. We talked about food, our jobs, the cities we're from (both Lexington and London), rent prices, our families, music (he really like Sinead O'Connor and Alanis Morrisette) and our travels. 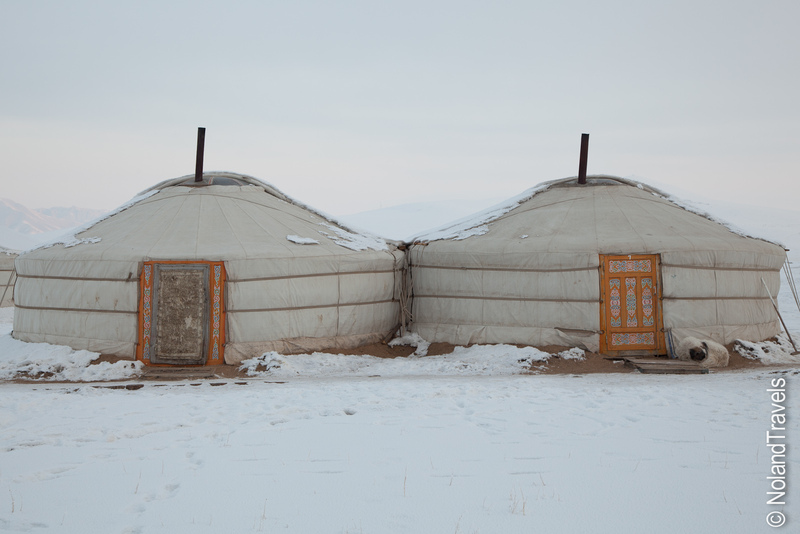 In our very first conversation we said we were going to Mongolia. Before we could finish he interrupted with, "Why?" and a confused look on his face. It became the running joke of the day - he just couldn't believe we were going to Mongolia. We had good fun sharing a few beers with him and talking about a little of everything. At some stop along the way Josh and Andre braved the cold temperatures for a drinks and pot noodle run. The train only stops for at most 20 minutes so you have to be quick. I stared out the window expectantly since I knew they were on a beer search. They came back with happy grins, a few extra beers and Andre commenting on the attractive lady working at the shop. He was an interesting fellow and possibly more so since he was roughly our age. He worked in the police force and was on his way to some training, leaving his wife and young daughter for a few weeks. Talking to him gave us an interesting view point into Russian life at our age. Sometimes he had to resort to using hand motions or pointing to things in his auto magazine to convey some words to us. A couple times after struggling for the English words, he would laugh and say, "my mother told me 'learn English, learn English, learn English'", while waving a pointed finger as you do when scolding a child. As we were saying our goodbye the next day when we arrived at his stop he thanked us for the free English lessons. Off he went leaving us to relish the chance of meeting him. We really had no idea what to expect for the border crossing and it made us a bit nervous. 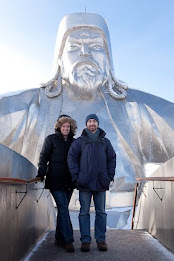 Part of our nerves were down to the fact that as Americans, we didn't have to have a Mongolian visa in advance. Although several sources had confirmed this it still felt odd showing up on a train without a visa. 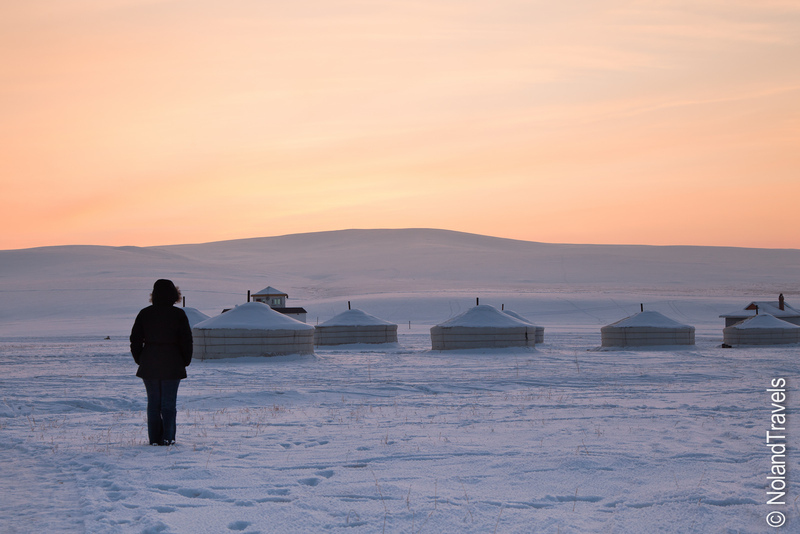 As we neared the border, the carriage attendant passed out Mongolian immigration forms. A few Russian border guards boarded the train and proceeded cabin by cabin, taking our passports. Then they were off and we just had to wait. About 45 minutes later they came back on, handed us back our passports with our Russian visa now showing an exit date. The process completed with a guard searching or our cabin We can only imagine they were looking for stowaways or clearly obvious immigration rule violations. They only really lifted up the seats to see our stored luggage sitting there, nothing to worry about. The train started again and rolled about 20 minutes down the track before stopping again. 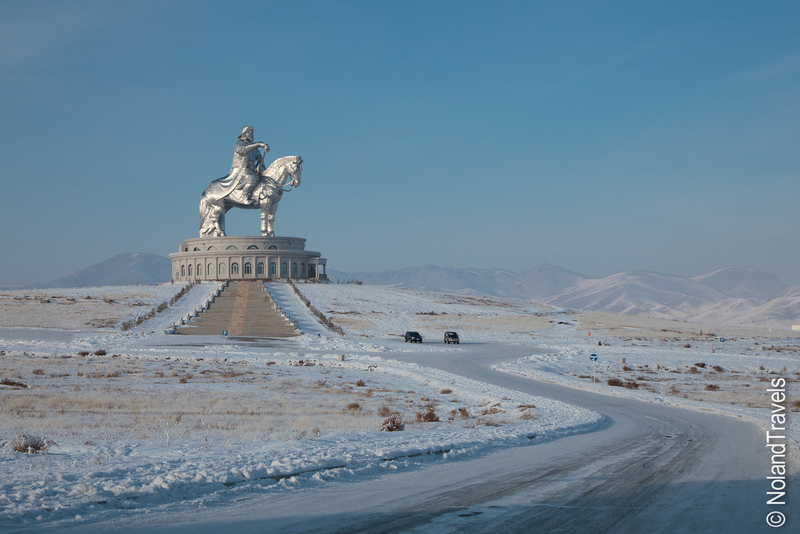 This time at the Mongolian side. Here they collected the immigration forms, collected passports and did the same cabin inspection. All in all, very uneventful. Border formalities completed, we were ready to head to bed as we would arrive in Ulaanbaatar, Mongolia early the next morning. The Chinese / Mongolian border crossing had a little bit of added drama. Russia built their extensive railway system with a wider gauge track than the rest of Europe and Asia; and because Russia heavily controlled/supported development in Mongolia they, too, had the same larger tracks. This means you need to change out the wheels, also known as bogeys, of the train cars at the border. So how do change the wheels on an entire train with passengers still in them? We were anxious to find out! We pulled in to the border station and the Chinese border guards came on, took our passports and began the immigration process. The train then reversed from the platform back to a huge long building so they could change the bogeys protected from the elements. Once inside the building, all the carriages were separated and each one was lifted up. 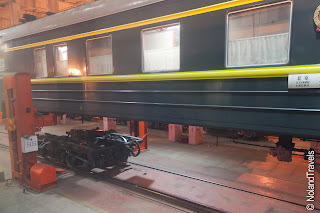 We could hear them working underneath the carriage and we could only imagine they disconnected the Russian wheels and rolled in the Chinese wheels. This was quite a time-consuming process, we were told sometimes lasting 4 hours, so while we were all in the hall talking we got excited when another train pulled up next to us in the building for their wheel change. This gave us a clear view of what they were actually doing to our own train since we weren't allowed to exit. We were finally lowered back down on the new wheels. The only thing left was to reconnect the carriages and we'd be on our way. It had been nearly 4 hours without the use of the toilets so we were all getting anxious (the toilets just open up to the tracks below so clearly you can't use them if workmen are hanging out below!) I was talking to an English lady we had met, while standing at the door of our cabin with Josh was sitting inside. We could faintly hear some loud bang sounds about every 30 seconds and figured we were about done. Before too long, we found out what that "bang" was...I flung out my arms to catch myself as I was nearly knocked to the ground as the carriages behind us pushed in to ours to connect. Unfortunately for the little Mongolian toddler behind me, she couldn't catch herself as easily and fell firmly on her back at this huge jolt of the carriage. Thankfully there was a little carpet as padding (and she didn't really have that far to fall) so after a few tears of surprise she was ok. We were all left a little wide-eyed though - couldn't they have warned us? And with that, our train slowly backed out of the building, went forward to the original platform where our passports were returned and with our Chinese visa now validated we were off to Beijing. Reflecting back on the entire journey, it was pretty awesome. The cities we stopped in were all epic in their own way. 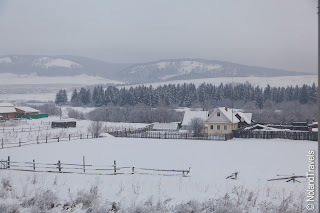 The journey itself was beautiful, fascinating and peaceful during the winter. What would we do different? Not much. 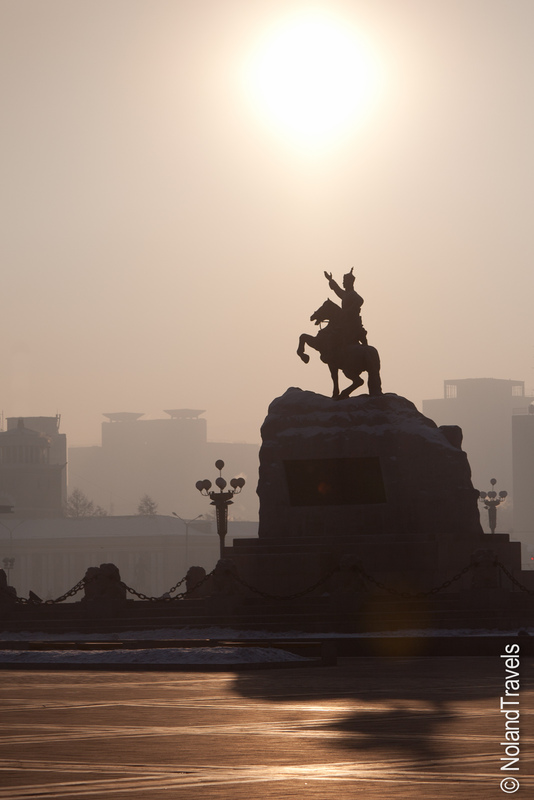 We recommend the stops along the way which give you more of a feel for Russia. Things change drastically outside of Moscow and St. Petersburg so try and see another city or two. 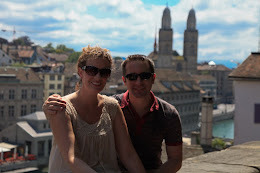 The combination of epic cities and a truly relaxing train journey made for an amazing start to our 5 months of travel. I know others interested in this journey will be asking themselves the same question. I think this is a matter of what you want to get out of the trip and sometimes, just general timing and availability. We had this epic vision in our minds of Russia in the winter and it DID NOT DISAPPOINT. Epic. Amazing. Cold. Awesome. 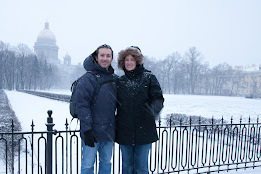 We loved Russia in the winter! The "timing" was also a big factor - based on our roughly planned "we want to hit certain countries in certain months for certain reasons" it just made sense for us to do the journey in January. The route was clearly not as busy as it may be in the summer, but we still met many people and honestly enjoyed a bit more space and relaxation. I think our only "disappointment" was that we couldn't do many of the outdoor activities in Mongolia that they are famous for. 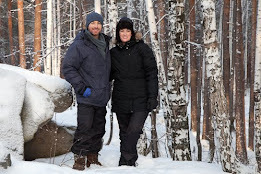 However, on the flip side, we did get to experience stunning cold weather that we may not experience ever again (well, at least until we travel to Antarctica...or Greenland...or Alaska...ok, we may experience it again!). 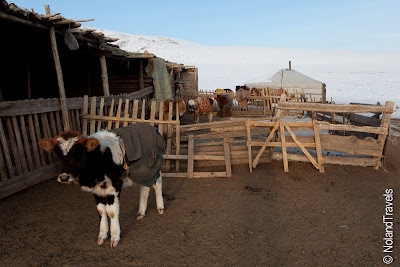 The winter Mongolian countryside was beautiful; we got to see their farm animals wearing "clothes" and their hearty food and infamous milky tea might be almost unbearable in a hot summer. We do think Mongolia would be amazing in the Spring so maybe we'll have to go back (they have some insanely hot summers too so be mindful when travel planning!). So, there you go. Decide what you want out of the trip and go with it. 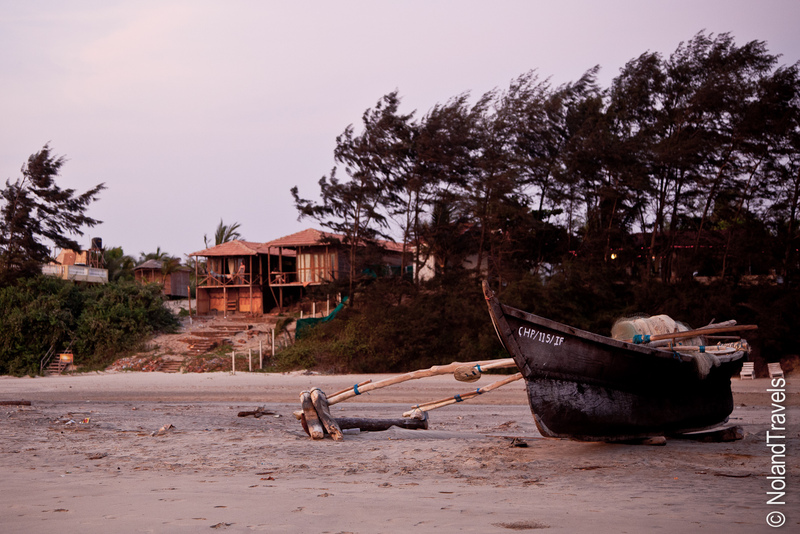 I guarantee any time of the year you will come away with an unforgettable journey of a lifetime! I'll leave you with a quirky bit of nostalgia. The engine of one of our trains was our age. Yep, built in 1980. And in the USSR! Is there any aspect of the journey that you're still curious about? We'd be happy to expand on our experience! Just drop us a comment on the blog and we'll do our best to respond. Notes From the Travel Desk - Goa! 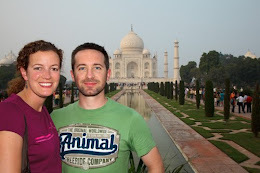 I can't believe April is nearly over and we've been in India the entire month. All sorts has been happening although its been a slow month from a blogging perspective. 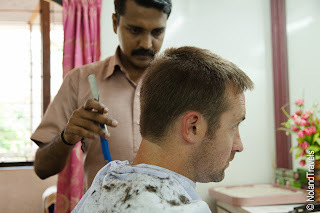 We've been making our way north from Kerala through Bangalore, Mysore and Hampi. We are now in Goa, settled on a quiet beach for some sun and sand. Expect another flurry of posts the next week or so as we try to get caught up. 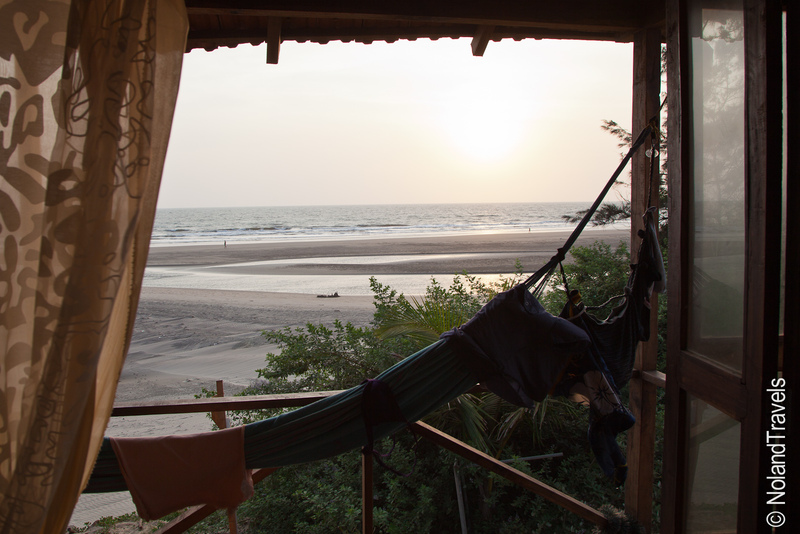 Here we found a great little cabin with a balcony overlooking the beach which you can see below. It's very quiet, nearing the end of the season, but the white sand and palm trees are still picturesque. Everything is awaiting the monsoon so a transformation is happening as resorts close and temporary structures are taken down until next year. The only restaurant around closes in another week so I guess we will have to move on then. Our cabin is simple but has big balcony doors that open allowing in the breeze. Without air conditioning this is a must. You can even see my sand castle in the middle of the picture above. 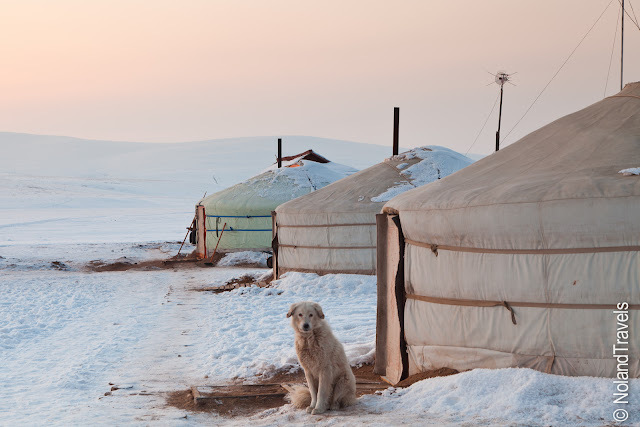 Mongolia is the most sparsely populated county in the world. 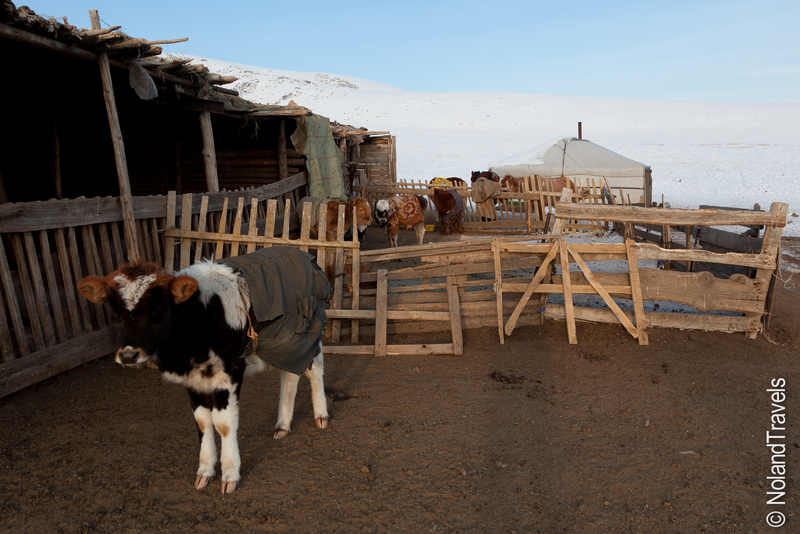 Outside of the capital much of the country survives on mining and agriculture in combination with a large percentage of the population that are nomadic herders living in Ger tents. 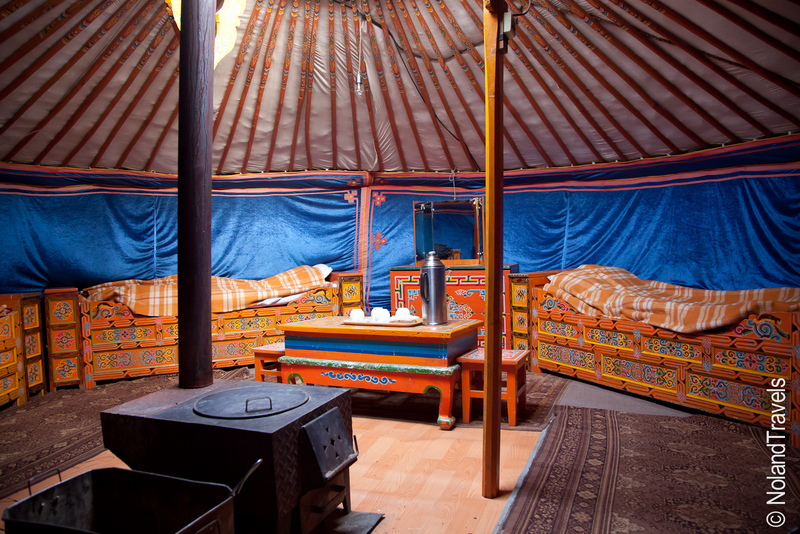 So, a trip to Mongolia would not be complete without taking yourself back in time and experiencing this lifestyle. Agi had arranged for us to have lunch with a local family in their Ger tent. 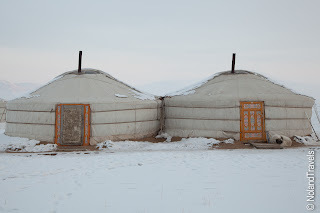 Being nomadic they move twice each year, once for the winter and once for the summer to situate themselves for seasonal benefits such as water or protection from cold winds. This particular home for the winter period was nestled nicely on the up slope of the mountains. They had one neighbor and both families shared the small shelter for the animals which included horses, chickens, cows and goats. Around the shelter the snow was cleared and the dirt was showing through. Upon arrival the man greeted us at the door to the tent and welcomed us into his home. We entered and were given a seat on the man's side of the tent which Agi had prepped us for. The tents are traditionally divided in half with the man's side was reserved for tools, motor bikes and the like, while the women's side, as I'm sure you can guess, is reserved for the kitchen and preparation of food. In the middle is the heart and soul of the Ger tent - the fire stoked oven - which also served as central heating. After sitting down and being served traditional goats milk tea (mainly milk, not so much tea), two things struck us instantly. First and foremost was how warm the tent was inside. Who would have thought that in the middle of winter it would feel like a sauna! My first instinct was to quickly take off my coat, hat and gloves to cool down. Secondly, we were amazed at how much space there was inside. The tents are round and everything in them is pushed to the outside walls of the tent. This creates a big space around the stove that gives the tent a very open feel. Around the edges the family had a couch and table, beds, dressers, cabinets, small tv, motor bike and sink. On the menu for lunch was a very hearty meal - a huge portion of a traditional dish of homemade noodles, mutton and onions. Served with bottomless goats milk tea! Remember how I was telling you that Agi and the driver like to joke around? Well they didn't tell us how to avoid getting refills of milk tea. As got to the bottom of our tea, the man or wife would always come and refill it, no matter how many "No thank you's" or "I'm full" we tried to translate. Each time Agi knowing we didn't want any more would laugh and say, "its good right"? Yes its good but I can only drink so much milk in one sitting. So, finally after our 3rd cereal sized bowl of tea she told us the secret. Hold you open hand over the bowl, palm down, covering the bowl. This signals you are finished. It worked for the food too, thankfully. We were stuffed to the brim on tea and noodles. However I do have to say, that in the middle of the winter the food was very tasty and really hit the spot. During our delicious lunch, we had an interesting hour or so conversing (translated, of course) with the man and his wife. He even took us on a quick tour outside his home showing us the animals. Not surprisingly, all the animals had small coats on to help protect them from the elements - made from scrap carpets or human clothing. After a successful late lunch we headed to our last stop of the day and our accommodation for the night - a ger encampment about 20 minutes away. 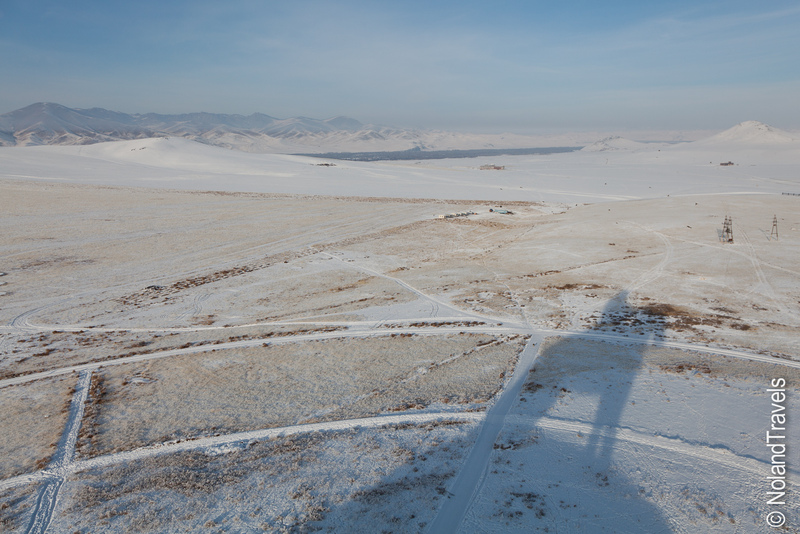 The encampment was set on an awe-inspiring plain, covered in pure white snow surrounded by hills and mountains. Driving up to it was awesome. The driver wasn't even using a road so we were cutting a fresh path in the snow. He had fun revving the engine and fish tailing the van in the snow and of course laughing all the way. Opening the van door we were greeted by some of the resident "guard" dogs that roam the camp. A little taken back at first as they were huge and nearly jumped in the van, they provided some added comfort guarding our tent throughout the night. We were then introduced to the locals who live at the camp and maintain the property. They grabbed our bags and led us to our tent. After being in the locals tent we had a better idea what to expect but it was so cool going in knowing we were staying the night. Inside the tent was very colorful and spacious. There were 4 beds, a table, rugs on the floor and some cabinets. To keep it warm the stove was stoked with coal and wood every 4 hours, so they warned us not to be surprised when we get a couple visits in the middle of the night - the attendants would be coming in to stoke the fire while we slept. The rest of the camp was very simple. A handful of ger tents, a restaurant (2 ger tents hooked together), two small buildings, one for coal and supply storage and the other a bigger dining hall for for use in the summer when all the tents are full - and we had the entire camp to ourselves! 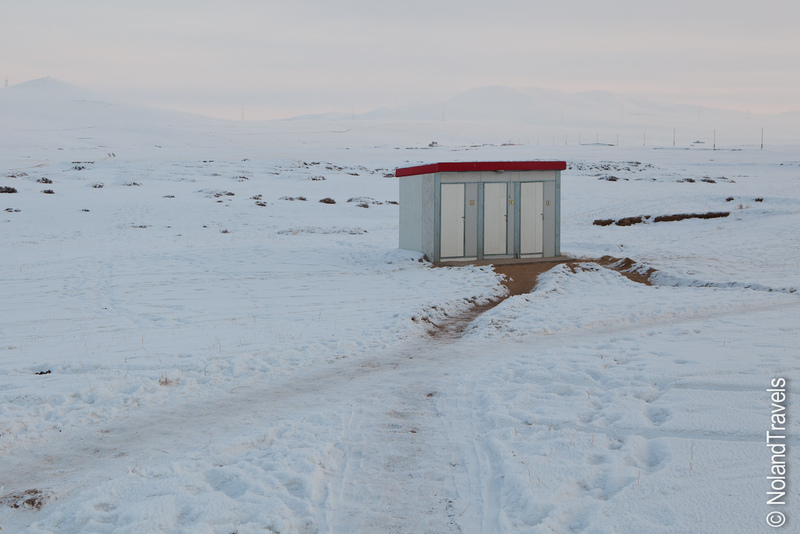 Oh and an outhouse on the edge of the camp. Being the only visitors was surreal. But I guess who else is crazy enough to stay here in those temperatures. 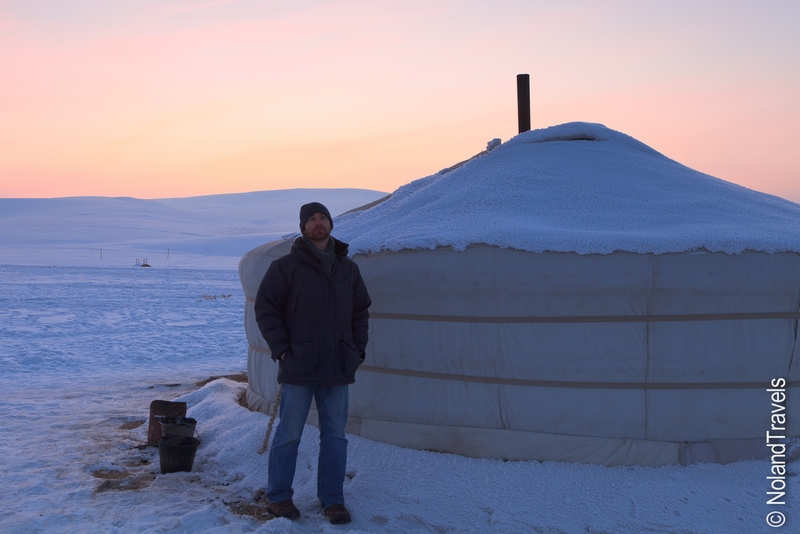 That night it dropped to -31F(-35C). The picture is from our van temperature gauge which stopped working when the temperatures went below -30. 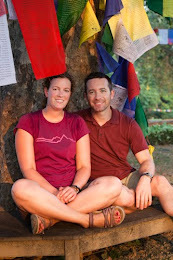 After arriving at the camp, we had a few hours before dinner so we relaxed and took photos. The scenery was just spectacular - the tents, snow, mountains and sunset. But taking photos in those temperatures was challenging, to say the least! The camera did ok although the LCD screen started to get sluggish, but it was the man taking the photos that really struggled. It went something like this: Setup the camera on the tripod. Run to the tent to warm up. Go back out, take a photo, run back to the tent to warm up. Repeat. Steph just relaxed inside and had a little laugh every time I came busting through the door. My hands were freezing! Eventually, Steph did have to venture out to check out the "ladies room". It had 3 doors and surprisingly even had men and women labels. 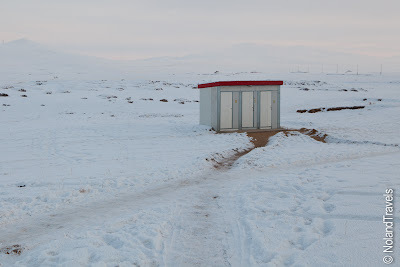 We both concluded they were fairly nice outhouses but it wasn't until a couple hours later that she casually said, "...thank goodness they have the heater in there...". Heater? Hang on wait, mine didn't have a heater! Needless to opted for the heated stall from there out. And as you can imagine, a middle of the night bathroom break was an adventure. For dinner we had another very hearty meal. Agi was very entertaining explaining about the food and culture. We even played some traditional games to wind down the evening. 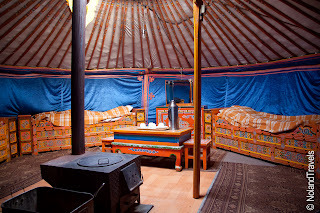 In the end, we retired to the warmth of the ger tent and had a cozy night's sleep after a long day of touring, freezing temperatures and hearty food. 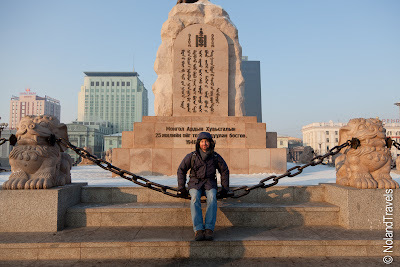 The next morning, we returned to Ulaanbaatar where we would spend our last night. We visited the natural history museum where we saw some interesting dinosaur fossils but learned that many of the best finds were actually in other countries like the US and UK. Mongolia is apparently a hot spot for fossils but in a similar story to their mineral riches, they didn't have the manpower or money to excavate them so other countries have taken advantage. With the cold temperatures, it made wandering around quite uncomfortable so after a little souvenir shopping we headed back to the hotel to relax before our last train segment to Beijing. 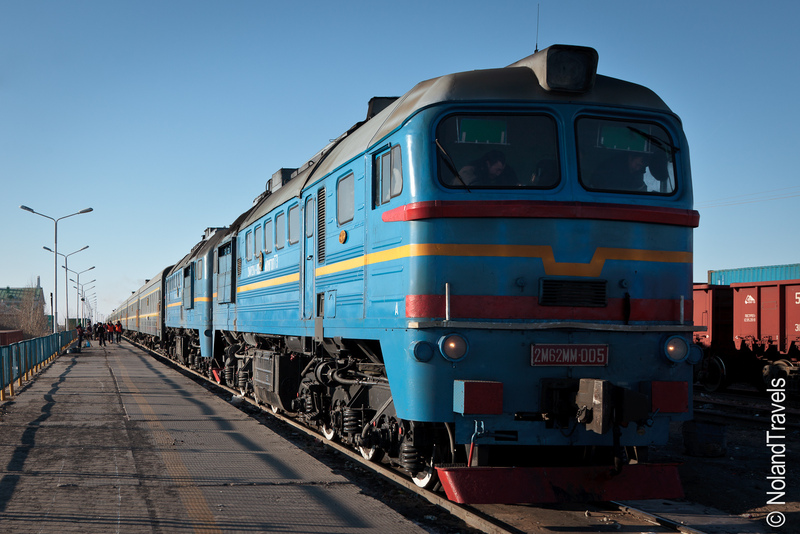 Our train pulled in to the capital, Ulaanbataar, in the wee hours of the morning. We had arranged a guide to pick us up at the station which in hindsight was a good call because it was cold and still dark! Times like these, being faced with a new or challenging environments, are when patience is hard to find. We had finally adapted to the tropical climate on the train so the extreme cold was a shock to the system. Once out in the elements, we were glad we didn't have to try and arrange our own transport to the hotel. Agreeing a taxi price in that weather could be dangerous in more ways than one. Have a read of our initial arrival. It all went smoothly as we quickly met our guide and hurried off to her van. Next stop - the hotel for a much needed freshening up after 3 days on a train. Walking down the hall of the hotel we went past a sign which read "Spa". Now you're taking, I said to myself. I sure could use a nice luxurious bath after that journey - baby wipes can only go so far! Entering the ladies room I was excited at the possible amenities that await. Well, it must be somewhat lost in translation because it was actually a "bath" room - let me explain. Public baths are somewhat common in Russia, Mongolia and other Asian countries. This was no different. It was a big room with an empty large triangular bath in the corner (normally filled with cooler water) and on the opposite wall were 6 low water faucets with sprayer hoses attached. At each faucet sat a little plastic stool and plastic bowl. I looked around carefully to make sure I wasn't missing anything...nope, no shower stall, no bracket on the wall to hold the hose like a shower - hmm. I quickly did the mental travel translation - I'm meant to sit on that plastic stool and use the hose sprayer and bowl to bathe. Right, this is going to be interesting! I smiled to myself wondering what Josh was thinking at his no doubt similar set up in the men's room. Needless to say, I was thankful that it was so early in the morning and that I had the room to myself. On top of my conservative nature, I needed time to figure out this new bathing technique which would have been a real test with others around! Clean and refreshed, we both emerged from our respective rooms. Shaking our heads at each other with a smirk on our face. We both laughed out loud knowing how awkward of a bath we had just taken. But we were clean and now ready for breakfast before a full day of touring. 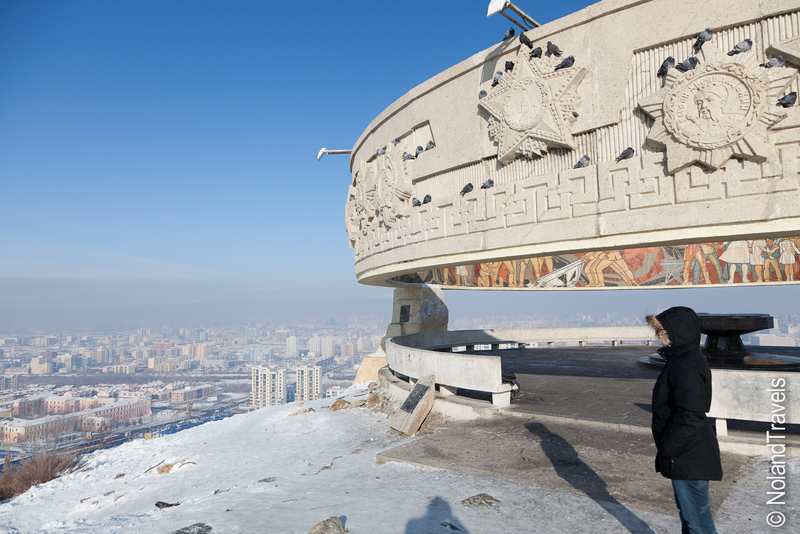 Our guide, Agi, was all smiles and excitement as she talked about Mongolian culture and showed us around town. The pride she had in her country was apparent. We walked around the main town square where Josh's beard started forming ice cycles underneath his nose within 10 minutes! Even with the sun now up over the horizon, it was still an uncomfortable cold. We admired the square along with the Abraham Lincoln like Ghengis Khan statue in front of the government building and headed back to the van to warm up. The next stop was the Zaisan Memorial which honors the many Soviet soldiers killed in WWII. It is perched high on top of a hill that provides a nice view of the city including a huge Buddha below. Sitting in the cozy warm van in the parking lot, Agi looked back at us and said, "Do you want to climb up?" Easy answer, of course. "Ok, well if you don't mind I'm not going to climb up. It's too cold and I've been up many times", she said. "I'll just wait in the van." We had a quick second thought but threw on our gloves and headed for the stairs. After admiring the view long enough that our toes and fingers began to tingle, we ran back down and jumped in the van once again and headed off to the countryside. Along the way, we stopped in a small town to pick up the chef - a young lady who would be our cook at the Ger camp later that night. Agi kept raving about our cook and how lucky her boyfriend must be which excited us for dinner. 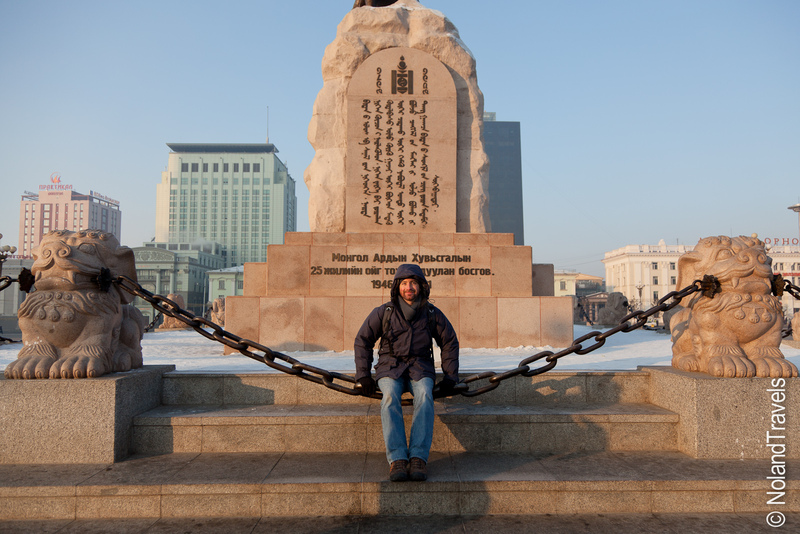 One thing we quickly realized is that most of the Mongolians we met have a good sense of humor. Agi and the driver were constantly making jokes and carrying on. When we stopped to pick up the chef, she ran towards the van and just as she got to the door the driver, starring in his side mirror, slowly moved forward, chuckling to himself. He finally let her in after a quick bang on the side of the van. They all had a good laugh after she shut the door. As we started heading down the road, we realized we take for granted a good quality road network. Mongolia must have some of the world's worst roads. Making our way out of town where the roads were rough, the road conditions quickly deteriorated even more - pot holes, patch work and just general sections of missing roads. Off the main road it quickly became just a dirt paths. It was mind boggling and interesting all the same. At times the driver chose to drive in the snow next to the road because it was faster and smoother. However, what they lack in roads they make up for in scenery. I'm going to give the road workers the benefit of the doubt thinking that they most likely are too distracted by the scenery to fix the pot holes. Rounding a corner at the top of a hill revealed a monumental view of vast expanse and simple country side. All blanketed beautifully in white snow with a mountain range hiding out in the background. For that moment the bumps in the road and the cold simply disappeared. What a site! As we drove further out of town Agi said she had a surprise for us. Knowing Agi this could be a trick. We were out in the middle of nowhere so what could she have up her sleeve. Then on the edge of the horizon a reflection of sunlight grabbed our attention. It was the new shiny stainless steel statue and memorial of Ghengis Khan. At 130 feet tall, it was easily recognizable amongst the countryside. There he was, perched on a horse starring out into the distance, no doubt admiring the view. 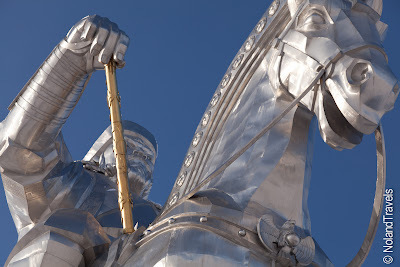 Within the base of the site were two excellent exhibitions - two private collectors had loaned their immaculate collections of Mongolian relics - everything from coins to swords to arrow tips to ornate jewelry and complete sets of chain mail armor. Everything piece was beautifully presented with dates and descriptive text. 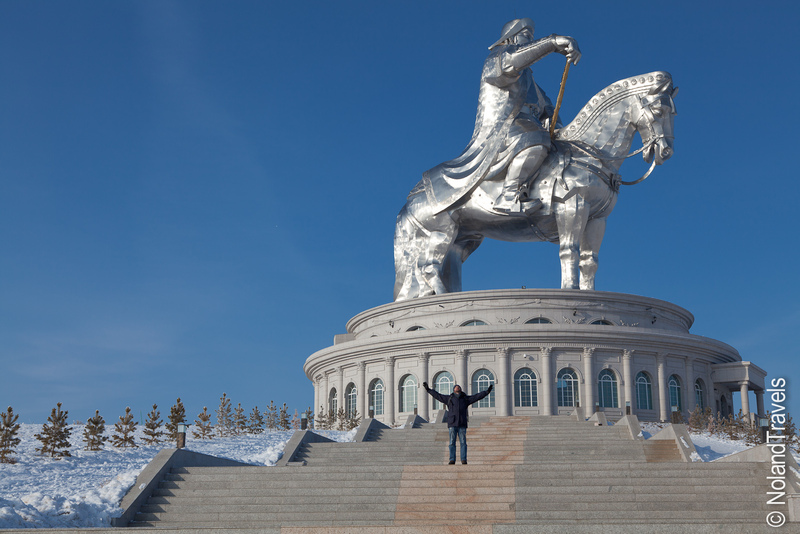 To top off the experience at the site, you could actually take an elevator and some stairs that lead out to a viewing platform on the horse's head where you could look up at Ghengis and admire the vast countryside where he once ruled. As we left the monument, Agi kept helping us work on our pronunciation, its "Ching-gis Khan" she kept saying. We tried to say it like she did but couldn't. 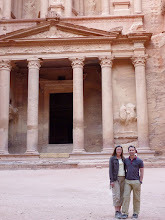 We were just to distracted by the monumental surroundings. Regardless, we drove away in awe of just seeing something truly amazing and it was only the morning! Think It Will Make It? We have decided we are carrying far too much stuff. Along the way we have picked up a few souvenirs and coupled with some of the extra stuff we have been carrying from the start, we decided to really slim down for the homestretch of our trip - just one backpack and the camera bag. We packed up everything we wanted to get rid of in one of our backpacks and headed to find an auto rickshaw to grab a ride to the post office. At the post office, we approached the counter inquiring about sending an international package. The man asked what package so I pointed to the backpack on my back. He shook his head and then directed me to come behind the counter to talk to the "assistant station chief". He spoke good english but was a busy man, signing and handing off various papers. Showing him the bag we wanted to ship he quickly shook his head and said we needed a box first. They don't sell boxes, doh! The China post office we used in January stocked plenty of boxes so we didn't even think to show up with a box. He said any shop would sell boxes. Where are one of these "any" shops we tried to ask? He was clearly getting frustrated that we were asking so many questions. We happened to spy a couple random boxes in the corner, "Can we have those?" Sure. Excellent! He then pointed to an area where a lady was sitting behind a sewing machine. "She will pack it", he motioned. With that he ushered us away and we headed to the lady. At her desk, she looked at the full backpack and our two empty boxes. "No", she shook her head and said, "no cloth". Enough with the shaking heads already, we need some okays. We just want to pack the box. "No cloth". 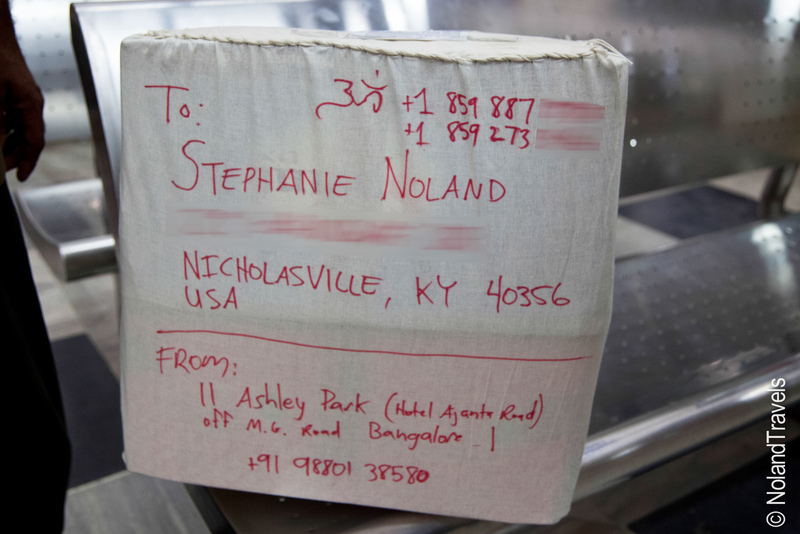 Thank goodness Steph ran across another traveller's blog who chronicled the adventure of sending her own package home from India and found out that they sew up each box in linen. So, this led to more questions about how we could get some cloth but unfortunately she didn't speak much English. She was able to convey that the post office closes at 5:30 but eventually tired of our questions and got up to go do some other work. Hmm, what do we do? Looking at each other we were both thinking the same thing. It was 5 o'clock and where were we going to get some cloth. Its India and things just don't move that fast. Looking at Steph, I said no way. Seeing that our English speaking assistant station chief was running around like crazy and refusing to give up, Steph said, "Go ask the driver and see what he can do". One good thing about the auto rickshaw rides is that the drivers will often wait while you run errands and ours was waiting outside. I ran outside and communicated that we needed some cloth to the driver, who spoke enough English to understand. We ran back inside to find out exactly where we could get the cloth. The lady told him and we sprinted out of the post office jumping in the auto and speeding off. Weaving through traffic the driver was a mad man! The traffic was thick but we soon reached a market area. Asking around the driver finally found out where we could by the cloth. He sped through the tiny alleys full of people and traffic and horns blaring. It was like a video game! Go, honk, swerve, honk, honk, BRAKES, speed up, jump speed bumps, dodge cow, horn, swerve! Finally, we pulled up to a small fabric shop where we quickly purchased the needed fabric. We sped off back to the post office. Same story. Flying through traffic, jumping speed bumps, horn blaring the entire time. I'm a pretty calm car rider and mostly enjoy the chaos of Indian roads, but this time all bets were off. Dodging big buses and other traffic is a nervous ride on good days, but with a driver in a hurry, it made for a tense ride. We made it back with 5 minutes to spare. I hurried up the stairs into the post office where Steph had transferred all our stuff, including the backpack itself, into a make shift box - two office paper boxes pushed together and taped at the seams. 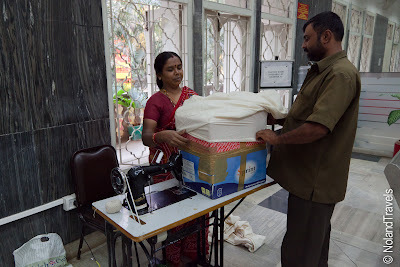 We handed the box and the fabric to the lady. "Too big", she said. Oh no, now she was saying the box was too big! Go get the station chief. Fortunately, he said all was fine, no problem, so the lady proceeded to wrap the box in fabric. First, she used the sewing machine to make a wrapper. Then she used a big needle and some heavy twine and hand sewed it shut. 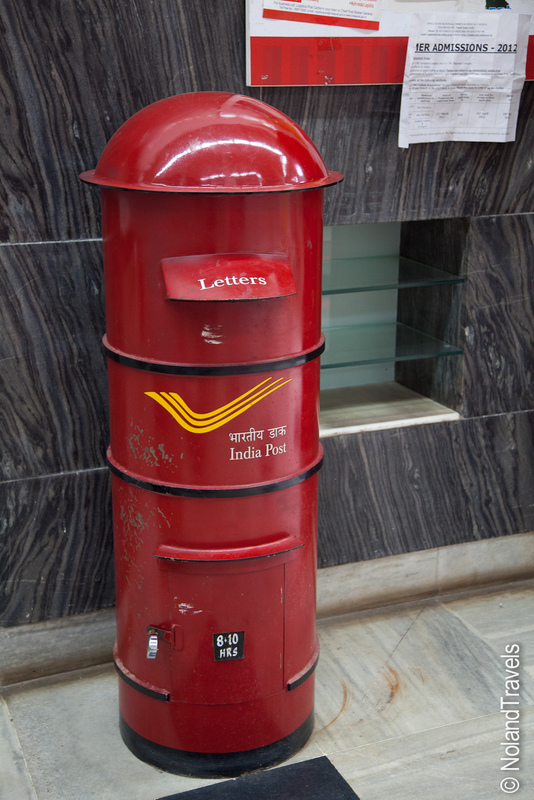 Finally, she handed us a big red marker after writing "To:" and something in Hindi on the package. We addressed the package and then she wanted a "From". From? We only have a hotel - that's fine, apparently. After some confusing conversations they said if it doesn't get to the US it will be sent to the hotel. Mental note - tell the hotel we shipped a package! Fully addressed, we handed it to the clerk. Weighed, paid and we were done! It was 5:45 but the package is on its way. Whew - what a mission! Say hello to The Ravindran Family! They have been our unbelievably gracious hosts in South India, allowing us to stay in their beautiful home amongst the iconic paddy fields and banana plantations. How do we know them? Well, their son Rupesh, is a good friend and colleague of mine who I worked with in London. He invited us to stay with his family and we were happy to accept his invitation. All throughout our stay we were cared for like family. Even though we had never met we were welcomed with open arms. So, it was only fitting that we'd be invited to meet the more of the family. It was the middle of the afternoon and we had just finished our normal coffee and homemade Indian sweets break. Mrs. Ravindran called us over. She opened a cabinet and presented me with a traditional Kerala men's outfit, a doti. It was a cream white, trimmed with real gold. I was stunned. 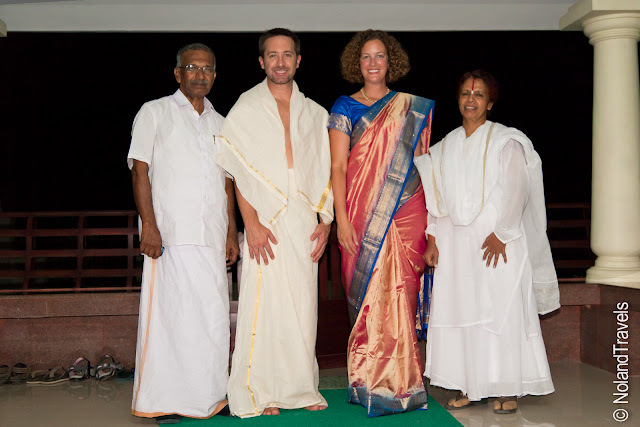 Then she looked at Steph and dug in her cabinet pulling out an outfit for her, a traditional Sari. "For you. Beautiful. ", she said, handing it to Steph. Not knowing what to do, we said thank you a few times and then just looked at the new clothes. It was too much. Our minds were racing on how to handle this from a cultural point of view. We knew we should at least try them on, but how? How do you wear these new outfits? No clue. Steph tried on the pre-made sari top immediately and Rupesh's sister, Reshmi made the necessary alterations to make it fit perfectly. Mrs. R said we would wear them to visit a temple in Trivandrum and to visit her family. When it came time to don our new clothes, they knew we'd need a little help! Honestly I think they were more excited than we were to see us in the traditional clothes. No problem, we're game! Steph had assistance from 2 smiling ladies, both Mrs R and Reshmi (in the green on the right). They went into the bedroom and helped her put on the Sari. It was a full team effort, lots of wrapping and folding the silk all held together with few safety pins. She came out of the room all smiles, showing off her new look. However, walking took a little effort. It was wrapped snugly and brushed the floor, as its meant to be, she learned. Then it was my turn. I asked Rupesh's brother, Suresh (in the blue shirt to the left) and another family friend Babu, to show me how to put on the doti. First you stretch it out and fold it in half. Then wrap it around your waist keeping the gold trim straight down the side of your leg. Once its wrapped you pull it tight and tuck in the edge. Its actually not all that hard but for a first timer I definitely needed help. The last thing I wanted is for it to come loose and fall down! The top was just folded in a triangle then wrapped loosely around my shoulders. As I've said before, you must go with the flow when traveling. This was no exception. 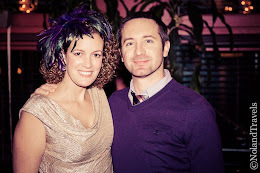 We were now both traditionally dressed, but now what? Luckily we didn't have to decide. We were directed to the front porch for some photos with the rest of the immediate family. Pulling up to the first house, only a few minutes away, a smiling family emerged welcoming us into their home. This was the home of one of Mrs. R's sisters. We made a few introductions and then headed to the dining room to visit. There was food spread out for us to try. 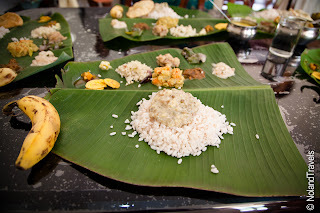 Watermelon juice, bananas, and some rice cooked in a banana leaf with grated coconut filling. Is this dinner, we wondered? Sitting around the table we had a lot of conversation as both parties were so curious. We were soaking up the culture and they were learning about us. A lot of laughing and carrying on, coupled with delicious homemade snacks and fresh fruit made for an entertaining visit. Steph was even invited to one of the daughter's room where she received a gift. A box of bangles and a keychain, complete with a message on the outside of the box that started, "Dearest Steph..." This just highlights the kindness showed to us by this loving family. The visit was topped off by a singing performance from Madhav (Rupesh's nephew) and one of the girls. One note for you travelers out there, the sister's family kept reiterating that if we had any friends who would like to visit, they would love to show you around. Anyway, saying goodbye, we were off to another house down the street. This was the home of one of Mrs R's brothers who you can see in the photo to the left. Entering the house my doti was failing down. I had tried to pull it tight but wasn't having much luck as Suresh noticed and sprung into action. He quickly tightened my doti around my waist and everybody else chuckled. Awkward but no worries. After the introductions, yet more food. This time a portion of fresh mango! So refreshing! Back at home we still had one more thing on the schedule - dinner! An event in itself. Looking back, I hope the family enjoyed the evening as much as we did. I know Mrs R did! She was all smiles the entire evening. It was such a privilege being able to visit the families' homes. They were all so friendly and welcoming. If you can't tell, we are in India! 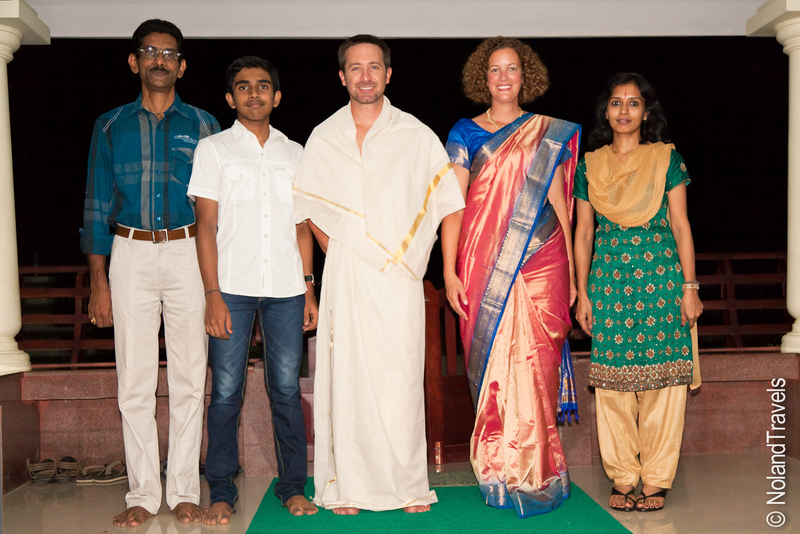 More specifically, in south India in the state of Kerala at the home of a friend of mine I worked with in London. His family has given us an unexpected treat by letting us stay in their unique home in the midst of banana plantations and paddy fields. I'll post a bit more detail later but for now wanted to send out a big thank you to the Ravindran family. They have been incredibly gracious hosts and we have been honored to spend some time with you. We haven't been up to much other than soaking in the culture, food and chaos. We've done some serious eating. 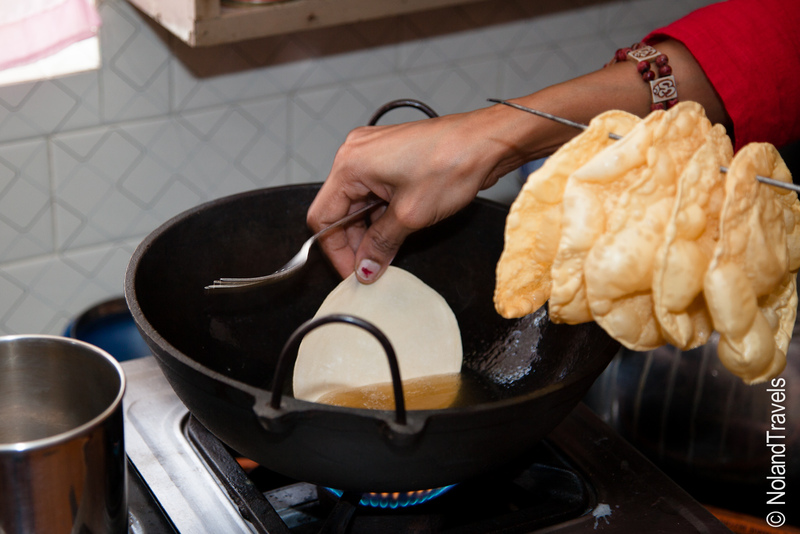 The ladies in the family have cooked amazing meal after meal giving us an intimate look at traditional dishes and some of the regulars they eat every day. Food is such a big part of Indian culture and we indulged to no end in the amazing delights of South Indian cuisine. It became almost a ritual day after day. Entering the dining room there would be a spread of dishes waiting for us on the table. We'd sit down and they would explain what they had cooked. It was usually a 5 minute Q and A session that only spurred on the excitement of the meal. We even learned to eat without silverware which is customary. You can see one of our favorite meals on the banana leaf and some fresh popadams being fried in the kitchen. From breakfast to lunch to dinner the variety of the food is impressive. Most are centered around rice, coconuts and curry but all are TASTY! I just wish I could remember all the names and ingredients of the dishes to make them when we get home. We made a short trip down to Trivandrum, still staying with the family, to explore that city and its beaches. We are now in a city called Kumarakom where we took a backwater river cruise. Now we are riding out the Easter weekend holiday and catching up on a few things, namely basketball and the much dreaded taxes. Oh and I had a hair cut. For now, I'll leave you with a couple teaser photos. 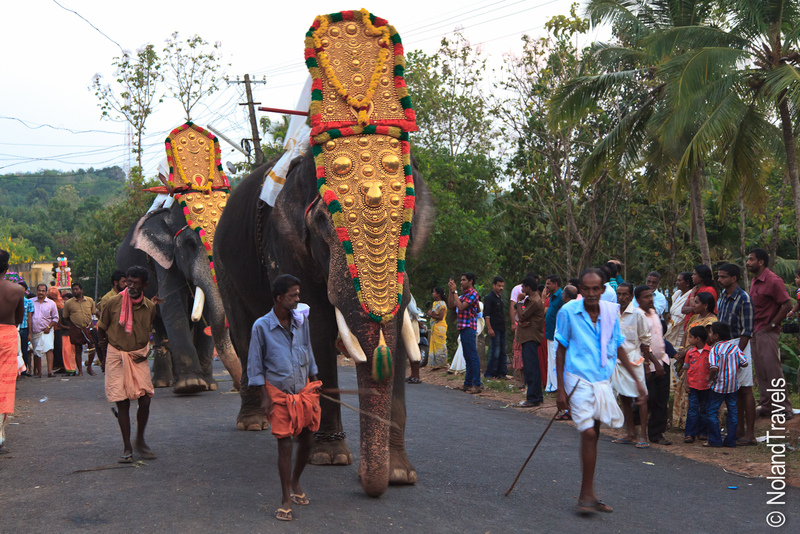 First, some majestic elephants at an exciting temple festival we went to just down the road from where we were staying. I'm not sure who was more interesting to the crowd, them or us? It was a fun night of handshakes and hellos meeting everyone. Second, our view of the Cats taking home #8. We were lucky enough to borrow an internet connection for a few hours and thanks to a handy proxy server, watch the final game live. You can see Steph celebrating and if you look close enough the trophy presententation on the laptop screen. I'm not going to lie, it was AWESOME! GO CATS! 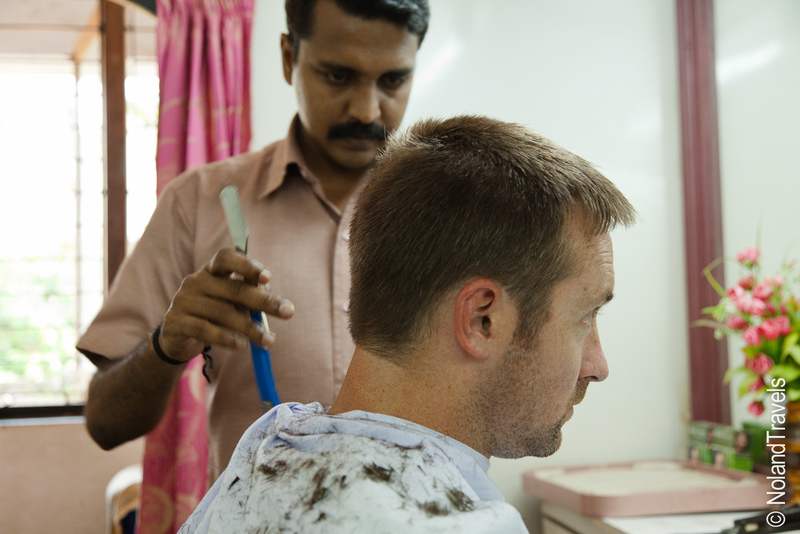 Staying with new friends in India. Thanks Rupesh! An incredible banana leaf canteen in KL. Thanks Leon! 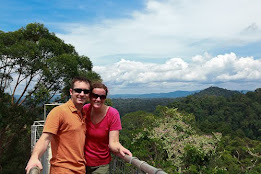 Enjoying the Rainforest and a canopy walk above the forest in the tiny but wealthy Brunei. With a change of countries comes a needed change of climate and island life. Its hard to beat snowy Red Square! 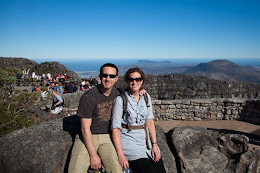 On top of table mountain after a cable car ride up. In front of the East Side Gallery, an art gallery on a remaining section of the Berlin Wall. Josh & Steph. Powered by Blogger.